Save Water, Save Money Live Healthy! Welcome to the home of earth friendly & affordable products. Need a Gift? Give a Rain Barrels R Us Gift Card! Let your loved ones redeam it when they are ready to install. All of our Rain Barrels are made from recycled food barrels. We do not manufacture new plastic rain barrels because we feel that would contradict our eco-friendly belief. We do not want to solve a problem only to create another one. 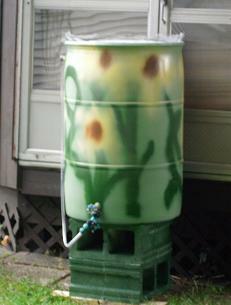 Rain Barrels are a great way to save money and help the environment. By using rain water we can preserve our drinking water. 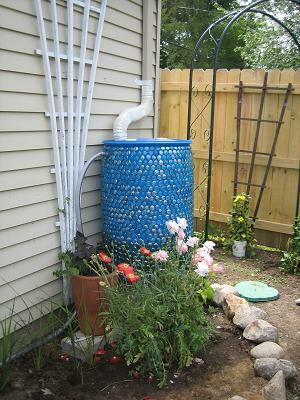 Rain barrels harvest the rain water off of the roof and store it for watering your plants, vegetable gardens and lawn. Hundreds of gallons of water from your roof ends up in the sewers. Why throw money down the drain when you can use it? In general rain water has less harmful chemicals and is Ph neutral. Rain water produces healthier plants and the best reason of all - it's FREE!! By using rain water we can preserve our drinking water and your cash. Hundreds of gallons of water from your roof ends up in the sewers. Why throw money down the drain when you can use it? 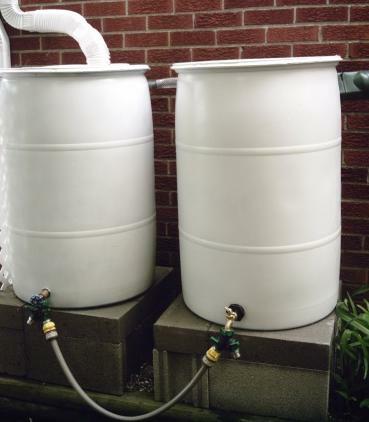 One inch of rain over an average two car garage will fill up to 4 (55 gal) rain barrels. That’s over 200 gallons of FREE water. Here are questions that people often ask about our rain barrels. 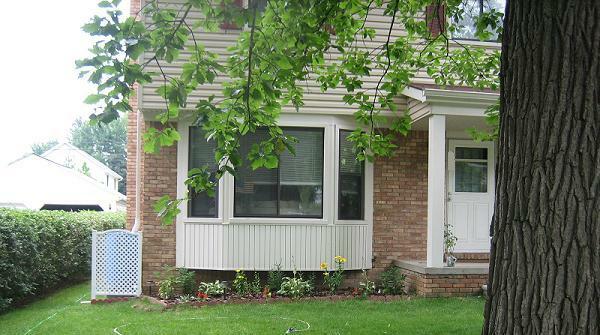 Question: Can the rain barrels be painted? Question: I am concerned about mosquitoes, are your rain barrels safe? Answer: Yes, Our rain barrels are designed as a sealed system to keep all insects out. Question: How can I increase the flow out of my barrel. 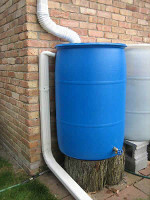 Answer: Rain barrels rely on gravity for flow. They are not pressurized like the water in your house. The more water in your barrel or higher the barrel - the greater the flow. You can use the P-Rana rain barrel pump. Question: How do you clean the inside of the barrels? Answer: Drain your barrel and pull it away from the house. Unscrew the small white caps and pop off the yellow cap. Use a spray nozzle connected to your house water line to spray the inside of the barrel. Open the spigot valve and let the water drain out. You can also turn the barrel upside down to get the last bit out. Question: How can I use my rain water to water my garden/lawn with a sprayer/sprinkler. Answer: We recommend using the P-RANA Rain Barrel Pump. 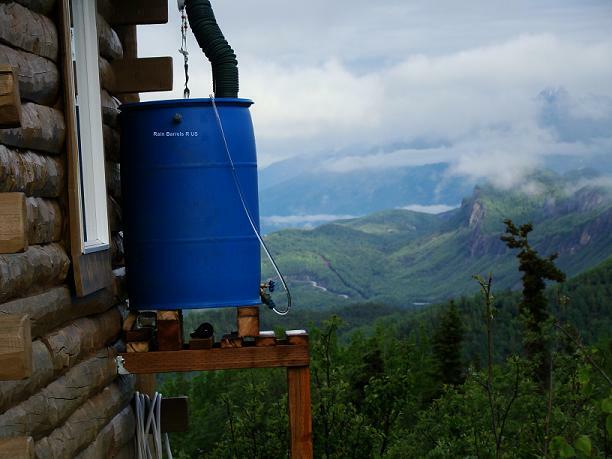 It’s the only pump designed to stay connected to rain barrel rain or shine. 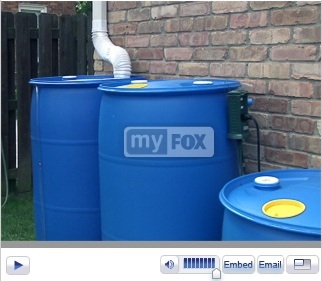 Answer: One inch of rain over an average two car garage will fill up to 4 (55 gal) rain barrels. That’s over 200 gallons of FREE water.